An industry standard since 1959, Transign Roller Curtains can be found on shuttles and transit vehicles of all types across the globe. For the modern fleet operator, Transign’s updated roller curtain signs offer unmatched efficiency in power draw, and unparalleled versatility in display options and customization. With their large lettering and bright backlighting, roller curtains have long been the iconic transit sign, and are often used for classic vehicle restoration or vintage bus art collections. 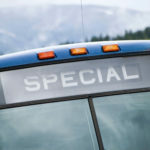 Because of their customization options, these signs are also used by colleges, sports teams, and other private shuttle or charter services with specific logos and color schemes. 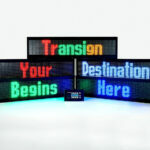 Operators can quickly change the messages displayed on both front-facing and curb-side destination signs using efficient electric motors. This allows for not only multiple destinations, but multiple personalized marketing messages to customers and prospects. Side signs are especially useful for relaying marketing or promotional information (such as sales or specials) to boarding customers and other prospects waiting at the curb. Combined branding and messaging has never been easier. Roller curtains are highly customizable, and Transign’s graphics design team can quickly create the necessary graphics to meet any branding needs. Color selections, logo designs, and high-resolution graphics, along with suitable fonts, are all printed in an aesthetically appealing manner to create a complete advertisement that can be displayed on a roller curtain. Roller signs from Transign also offer reprints and curtain updates as per the changing fleet requirements. Roller signs are considered to be an affordable alternative to LED scroll signs, custom designed to fit smaller fleets, cutaway buses, collector vehicles, and trolleys. 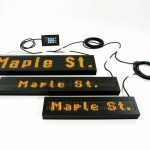 They offer excellent visibility at up to 500 feet along with ADA compliant fonts and colors. Roller curtain signs are very easy to install, are virtually maintenance free, and their long life cycle makes them an excellent value for any fleet.